I have recently bought a new horse, but turns out none of my saddles fit him because he's so large. I will be selling two them so I can buy a new one. My question is do y'all know anyone out there that makes a saddle with an eight inch gullet? Any help will be greatly appreciated. Also, this will need to be a good quality saddle, since it will be used for barrel racing. Thanks. Colorado Saddlery makes a draft saddle with an 8" gullet. I don't know anything about it, but I did run across a review when I was looking for a saddle for my big mule. 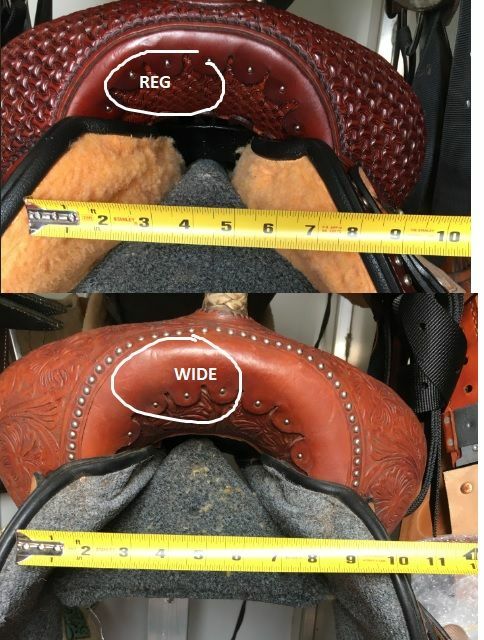 The reviewer said that saddle was great quality, but complained that it was very heavy and very large (it seems like that would go without saying for a saddle with an 8" gullet). Thank you for the idea, but I'm not sure that that is what's going to work for me, but I really appreciate it. Can you post pictures of your horse? Keep in mind that that bar angle is just as important as the gullet. I use a Circle Y Flex2 saddle on my horses. Love them. Red gets the WIDE and Shotgun has the REGULAR (and Dexter actually fits pretty good in the regular too). For my own curiosity, I put the gullets side by side (picture). The regular is even still close to an 8, but I just really like the concept of the saddle. The leather quality could be better .... but the fit is great. No dry spots on either of them. I've tried so many different saddles when I was shopping for the both of them over the years and quite honestly, I don't think I'll ever go back to any other saddle line. I have been so happy and they fit right off the bat. I really appreciate the help, but I found a saddle before I looked back on here. It's a Charmayne James Cactus saddle that has an 8 inch gullet and it fits him amazingly! My trainer has one just like it and let me try hers before I bought one, so I wasn't just blindly buying a saddle I thought would fit. To answer your question about it being too narrow, I'm positive it was because I felt like I was just perched on top of him... Thank you so much for responding and helping! !